Looking for that sweet spot of a client list? Time to make some sweet, sweet noise that the right people that make your business worth wild can't resist. An attractant that will call in followers, clients, business deals, etc. Time to shine bright and be seen for the work you do! How you handle your own reputation is up to you. Creating a lasting and ever growing client list can be a delicate balance of what you want versus what you can actually handle. This blend will grow with you; Dragons Blood and Cinnamon, to help you create a base list of clients, protecting and balancing it with ease, and Honey to attract more as you and your business grow, then topped with Alfalfa and 5 Finger Grass, again for business management and positive money flow, and lastly Calamus to enchant and entice that continuous flow of clientele needed to let your business thrive. 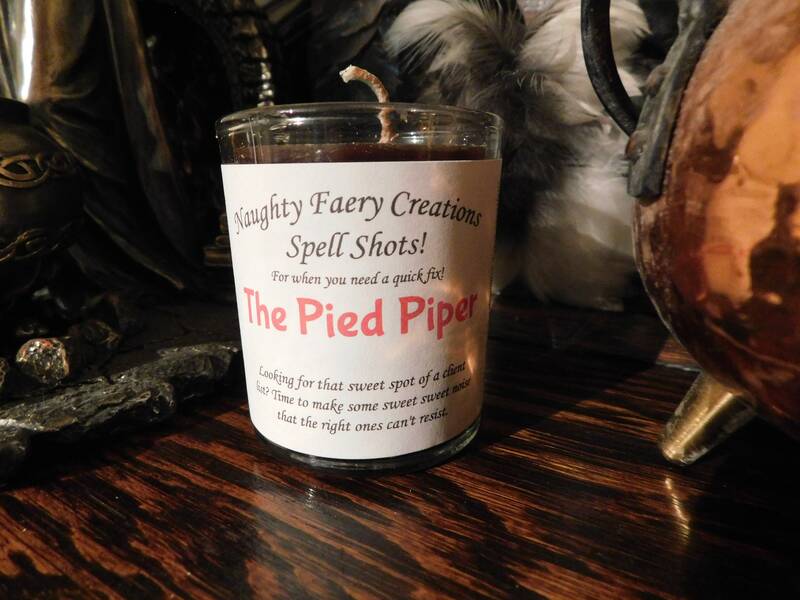 Small magical candles that are packed with a mighty punch, just like a SHOT! Each blend has been a labor of love from being a professional Candle Magic Specialist in a Witch Shop. Each candle is fused with a special oil blend and then hand topped with herbs as a finishing touch to lock in the needed outcome. Yes, by definition I am a witch. I first started making intention candles for people 15 years ago and have been continuing to do so ever since. I have been an actively practicing Witch for almost 20 years specializing in simple, no nonsense, manifestation magic as a solitary practitioner, a teacher over the last 10 years, and of course as, a professional specialist for the past 13 years. 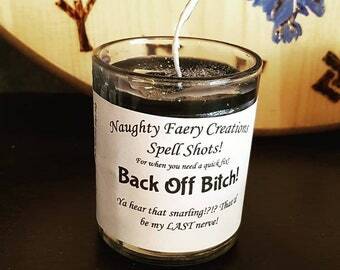 These candles originally were sold exclusively at The Green Man Store in North Hollywood, CA, and a monthly Burlesque event called Belle, Book, and Candle, where they developed their own personal following. Since these are hand poured candles, colors will often vary slightly. Great candle, can not wait to try it out after Mercery retrograde is over. Really nice items from a really nice seller - thanks so much for the samples. I LOVE the scents and quality of these incenses! Though I don't think you'll be disappointed. I'm a perfectionist :P Exchanges are permissible but you must contact me asap and if you order another item, I will send the exchange and not add for the extra shipping. If you would like to UPDATE your shipping costs for UPS or Fed Ex or even just faster overnight service, please feel free to contact me so that we can find the most inexpensive cost for your needs. Otherwise all shipments are made via Priority Mail & the going rate found at the USPS site. If you have specific wants for a candle, jewelry, crowns, or want a gift basket made. Contact me!! I'd be more than happy to help in any way & create a special candle just for you. I've been dressing candles for over 8 years in varrious stores that I worked at or helped out.